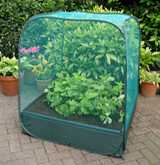 The 6mm netting offers great protection against birds, rabbits and larger insects. Ground pegs supplied. Can be used independantly or with RB100 Raised bed.